And now, roasted crucifers are going to be a new “meaty” option for me in big salads. Don’t get me wrong, cauliflower’s not nutrient dense in the same way that lentils or crumbled veggie burgers usually are (not quite as much iron or protein). 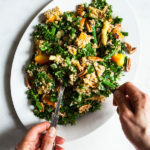 But it’s got a crispy, satisfying texture that really elevates a salad from a simple vegetable medley to something that feels substantive and special. With the right spice rub–like the incredible one I’m about to share–cauliflower’s destined to be your new salad topper. This salad has taste, texture, and an incredible array of phytonutrient-rich, colorful plant foods. It’s beautiful to look at, and I hope you’ll enjoy it as much as I do. Preheat the oven to 425. Toss the cauliflower florets with two tablespoons of the olive oil in a large mixing bowl, and then add the chili powder, paprika, coriander, cumin, pepper flakes, and a generous pinch of salt. Mix until the cauliflower is evenly coated with the spice rub. Place the cauliflower on a baking sheet and bake for 20 minutes, or until the cauliflower is getting crispy. Turn off the oven and set the cauliflower aside. Whisk the remaining two tablespoons of olive oil together with the lemon juice, agave, nutritional yeast, and some salt and pepper to taste for a quick vinaigrette. Massage the vinaigrette into the kale, working until the kale is wilted and evenly coated. Toss in the purple cabbage, pomegranate arils, and the roasted cauliflower. Serve. And voila. To save a little time, you can roast the cauliflower a day in advance. But if you do that, you’ll of course have to resist the temptation to eat it all before you ever get to the salad! I’d probably serve this salad with a solid protein source, like some legumes, some tofu or tempeh, or a quinoa pilaf. A side of brown rice or toast would also be a nice complement. No matter what, enjoy this festive and colorful dish! Roasted cauliflower is probably one of my favorite things…ever. Oftentimes I’m too lazy to roast my own (even though it’s embarrassingly easy) so I get the roasted cauli from Whole Foods. Ahh, it’s so good. But yours sounds even more amazing with all the spices! 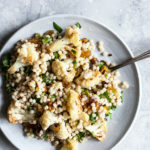 I am a roasted vegetable fanatic, but I still have not tried roasted cauliflower! I have a head of it in the fridge that looks perfect for this recipe. OHMYGOSH you have to try roasted cauliflower! It is delicious. This looks amazing !! I love the flavors of kale and pomegranate- yum! Roasted cauliflower plus plenty of kale sounds like the best possible salad for fall! I love the idea of adding crunch and tang with pomegranate too. Salad looks incredible!!! I love your use of cruciferous veggies. 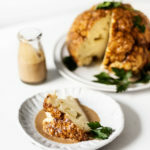 I love roasted cauliflower in all ways! I did roasted cauli slabs with chimmichurri as a main for a holiday that was great. Always add notes about how to make a meal more filling or complete! I love sharing your recipes with my omni friends but i swear their first reaction is always either “well, as an appetizer maybe, i’d still be hungry” or some kind of grumble about adding an omni protein on top…! Gah!! NO!!! I also think that without a notation its implied the dish is a full meal, and readers may feel like they are somehow wrong for wanting or needing more to be full. This sounds so good. I think an easy way to bulk it would be to simply add cooked chickpeas to the bowl with the cauliflower and let it get in on that spice rub action! Then just roast the cauliflower and chickpeas up together. Thanks for the inspiration! Made this for dinner tonight. Delicious. Loved the spicy cauliflower!